There is one more useful feature in Memory Cleaner, which is displayed below the Memory usage list. It is your Disk usage. You may have a large number of junk files, duplicates, and caches that take up most of the space on your hard drive. You can find and delete all these unneeded files quickly and easily with this app, as Memory Cleaner synchronizes with other Nektony Cleanup tools. Download a free trial of MacCleaner Pro and scan your disk to find and delete caches, logs, downloads, duplicates and other unnecessary files and folders. 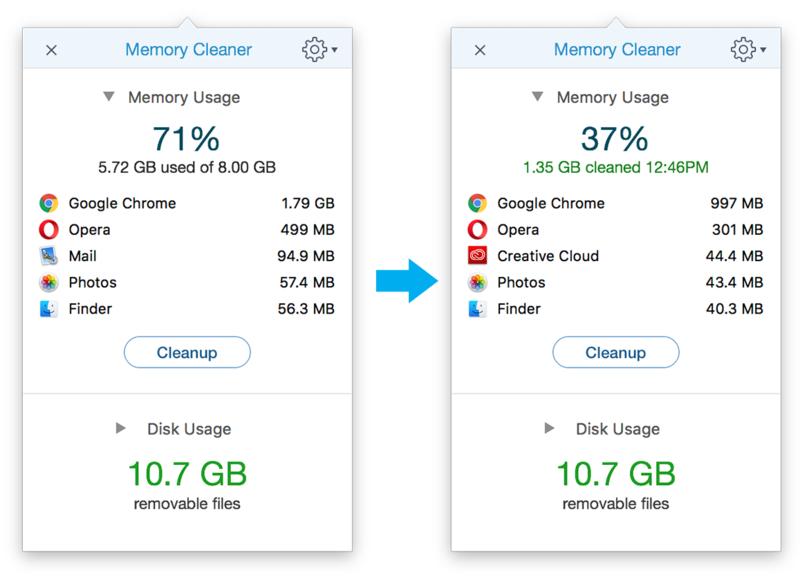 Click on the Details button to find smart tips on how to free up disk space on your Mac with Cleanup apps. You can follow these smart tips and clean up your Mac manually, as well. In the fast Cleanup tabs, you can see the size of the junk files, duplicates, unused biggest files and unused applications that can be removed from your hard drive.